I offer a variety of instruments of different types to all levels of musicians, for professional, amateurs and student players…from full size violins down to 1/8th size as well as all sizes of violas and cellos. A violin made by Andrea Cortese, 1926. This is a vintage Italian violin. Call for price. A violin made by Lothar Meisel, Owatonna, Minnesota, 2002. Lothar was the last of nine generations of a German violin making family. This one is in great condition, and is one of the nicest violins I've seen from Mr. Meisel. Don't confuse Lothar Meisel with the commercially made Meisel violins. Those are a different family of makers. This one was made entirely by Lothar alone and is much better quality. Seven vintage violins by Minneapolis maker Mathias Dahl between 1939 and 1973. Call for availablity and prices. Mr. Dahl was one of the most successful violin makers of his era. He made a large number of instruments, and had the most important violin shop in Minneapolis. Many professional players have used his instruments. call for prices and availabliity. A fine violin by Geary Baese; $16,000. Geary Baese is one of the most interesting figures in American violin making today. He has taught countless masterclasses in violin making and in making varnish. He wrote the book "Classic Italian Violin Varnish". This violin was made by Geary in 1993. Many of the finest Luthiers working now studied at some time with Geary Baese. This beautiful violin by Geary has a powerful and clear sound. It was made in collaboration with his friends Joseph Curtin and Greg Alf. This is a clean authentic Italian violin in excellent condition. Monnig, Fritz, ca. 1920-1930, Markneukirchen, Germany. Monnig, Fritz b.1890 Markneukirchen. Pupil of M. Schmidt, worked for A Hollinger in Kiel, G. Winterling in Hamburg, and Hammig in Berlin. Master of the Luthiers guild 1913. Fine copies of classical models. Highly regarded repairer anbd restorer." This violin was made in Sacramento, California, 1980. It was played for many years by a professional musician in Nebraska. Muller was at one time the west coast representative for Emil Herrmann. He made more than 200 violins, about 50 violas, and 20 cellos. Professional maker, winner of multiple international awards. Tetsuya Kimura, Hellifield, UK. 2006. $10,000 Mr. Kimura was professionally trained in the UK and has his own shop now in Japan. Steven Tillingast Cundall, Aubrey, Texas 2008- $7500 Mr. Cundall grew up in his father's violin shop in Texas. He furthered his training at Bein and Fushi in Chicago. Scott Zumberge, Minneapolis, 1983-$4000. Scott Zumberge was a violin maker, repairer, and a bow repairmain. Many instruments are available and will be added soon. Some are new and some are old. "Revelle" Model 600 2014 $938. West Coast Strings, "Dario Giovanni", 2017, China, one-piece back. I have many 3/4 violins in the shop for sale. Prices are from $300.00 to $3500.00. I list just a few here. A violin by Phan Than Tien (Scott P.) Ho Chi Minh City, Vietnam, with a handsome one-piece back. $600. Many more violins are available. Prices range from $300 to $2000.00. Call for details. 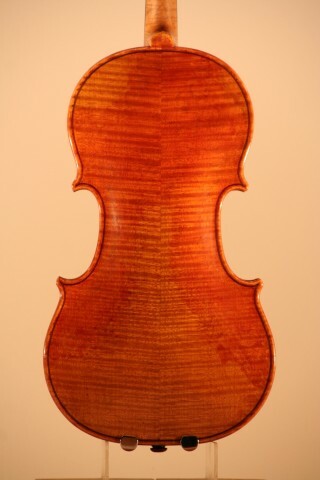 I currently have 36 3/4 size violins available, along with a great selection of cases and bows. Below are a few of the makers. "Da Vinci" Sofia Bulgaria, Silvio Marinov, Bulgaria, Scott Cao (several examples), Clemente & Weise, Germany, Scott & Shangming, E. R. Pfretzschner, Bernd Dimbath, Los Angeles Strings "Frank Denti", Phan Thanh Tien, Peter Steinhaus, Johannes Kohr (several examples), Forest.